Join Empire Brewing Company for our 2nd annual Girl Scout Cookie Pairing! Last year was such a hit we have decided to offer this exclusive pairing at both Empire locations. Each cookie has been thoughtfully paired with a 6oz pour of one of Empire’s tasty handcrafted brews that are sure to tantalize your taste buds. The fun starts at the Syracuse Brewpub on Monday, March 20 and picks up at the Farm Brewery in Cazenovia on Thursday, March 23. This tasty pairing is only available while supplies last, grab your sweet tooth and head to either Empire location starting the week of March 20! See you there. Empire Brewing Company is proud to present a new wave of creative brewing, being brought to you exclusively on draft at our Syracuse Brewpub and Cazenovia Farm Brewery. The Empire Farmhouse tap is a symbol of innovation and experimentation. It speaks to our brewer’s creativity and abilities, while giving our patrons the first taste into what is to come from Empire. We will be here to see what you like and use your pallet and expertise to guide us. The Farmhouse tap will be the front line for new styles before they are considered for bottling and distribution. Interested in Empire Brew’s you can’t find anywhere else? Our first Oops on our new 60BBL production brewery proved favorable by many Empire patrons, proof that good things can come from your worst days. This medium bodies IPA is jam packed with Mosaic hops and malt sweetness, and an aromatic hop nose from 50lbs of Citra that was dry-hopped during fermentation. Get the full story here. New England IPAs are beers that are purposely hazy or cloudy, which can give these brews a smooth, creamy mouthfeel, with little to no hop bitterness at the end utilizing hops that impart a tropical, juicy sweetness. If you’re feeling thirsty for one of these IPAs, remember they are on draft only at Empire Brewing Company. Visit us at our main page for hours of operation and what’s on tap! Follow us @empirebrew for the latest on our Farmhouse tap. What’s the buzz with the E-pairy honeybees in the winter? Honeybees are known as a super pollinator. 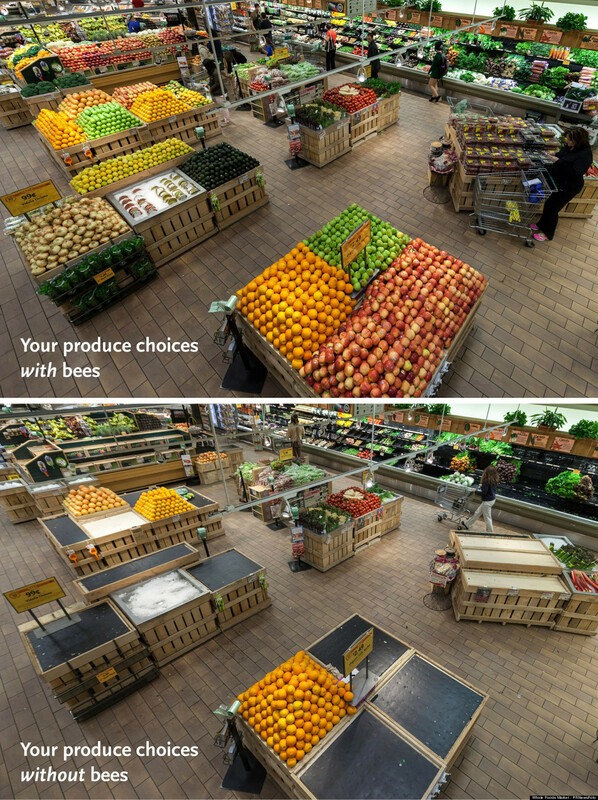 Have you seen recent campaigns that take all products that are created with the help of pollinators out of the grocery stores? Long story short, you’re not left with much. Spring and summer are a thriving time in agriculture with much help from pollinators like the honeybee, but what do our tiny friends do in our northern climates in the winter? Many of you have asked and we are here to give you the buzz. In mid-fall when nighttime temperatures start to consistently hit 40 degrees Fahrenheit an alarming pheromone is let off in the hive to signal a few practices. First, the female worker bees take it upon themselves to kick out the drone (male) population, equating for roughly ten percent of the colony. Drones serve one purpose and one purpose only, to inseminate a new queen and when honey (food) reserves are scarce during the winter they are kicked to the curb because we all know there is no such thing as a free lunch. Sorry, guys. Next, worker bees begin to cluster around the queen bee in a circular motion while flapping their wings to create heat. Worker bees weave from the outside to inside portions of the cluster to keep the colony warm. Clustering is a crucial practice that keeps the colony and queen at no lower than 45 degrees Fahrenheit so she is able to continue laying eggs throughout the winter, which determines the fate of the colony. The population of the colony drops drastically and the laying of eggs in early January is essential for the colony to repopulate in early spring. As the temperature rises and falls, the cluster expands and contracts. The bees within the cluster have access to the food stores of honey and pollen. During warm periods, the cluster shifts its position to cover new areas of comb containing honey. An extremely prolonged cold spell can prohibit cluster movement, and the bees may starve to death only inches away from honey. It’s upsetting to report that over 40% of honey bee colonies in the United States do not survive the winter and in New York State it is closer to a 50% failure rate. As a beekeeper all you can do is cultivate healthy hives that have a large population at the end of summer and plenty of honey and pollen stores, over 80lbs in colder northern climates! It’s not until the first warm days of spring where a hives fate is revealed and a beekeeper can either breathe easy or begin work on a new colony. That’s all from the E-pairy this year, thanks for following and keep your fingers crossed for a successful overwinter. Long live the honeybee! In October 2014, at a Brooklyn beer event, 5 friends decided to join forces over a unique beer collaboration by beer industry women. Empire Brewing Company welcomed the collaboration with open arms. The women presented the idea of a new beer style that would have big flavor and incorporate unique ingredients. Head Brewer, Tim Butler, was put to the test and delivered a recipe unlike any other. The collaboration’s success in 2014 made this an instant tradition for the ladies of Sweet Fire and Empire Brewing Company alike. Since that first brew in 2014 the Sweet Fire collaboration has grown to 14 women involved in the brewing process of the imperial stout. They are an eclectic group of women with a mutual love of craft beer. The women of Sweet Fire are entrepreneurs, sales woman, cicerones, managers, writers and representatives to some of the top beer establishments in the metro New York area. They come from far and wide, most moving to NYC in their adults lives and finding themselves in one of the fastest growing industries in the state, craft beer. In the past two years, the Brewsters, a term from the middle ages referring to female brewers, would create small batches on the Empire brewpub 7BBL system and release the liquid at limited quantities to the establishment’s they worked for. Much has changed for Empire Brewing Company in the past year in the opening of their 60BBL farm brewery in Cazenovia. This year the Sweet Fire women were invited to Central New York to brew on the state of the art production style brewery at a quantity for mass distribution in bottles and kegs throughout New York State and New Jersey. The liquid is available at a limited release while supplies last. Grow local, craft global. That is Empire Brewing Company’s mission. A long time advocate of supporting local businesses, Empire encourages you to shop locally this Holiday season! As added incentive, Empire has committed to donating 10% of all locally sourced artisan merchandise to local charity, Caz Cares. Stop by the Empire Farm Brewery and checkout the neighborhood craft!